If you are celebrating a special occasion and want to make a nice impression, this is the dish. I recommend to do this on the weekend since it is time-consuming, but worth every effort. First, start with the sauce and set aside. 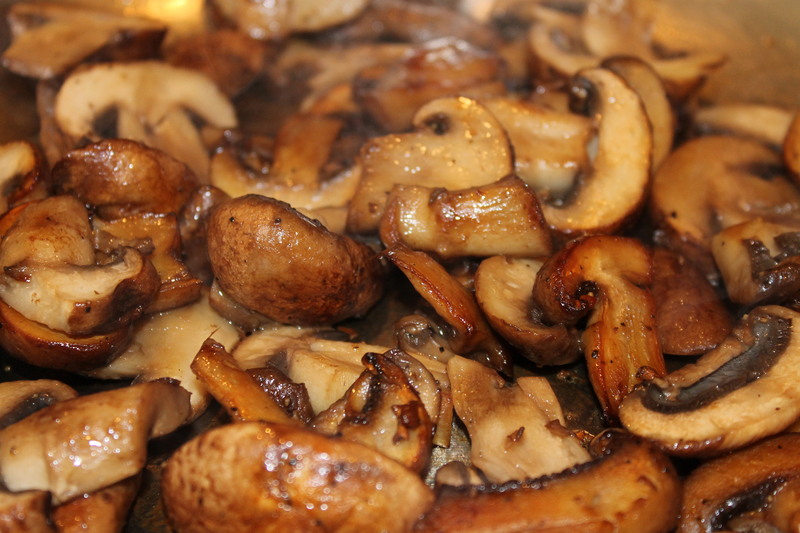 Decide what side/starch you’re making and start prepping, next, sauté the mushrooms. Lastly, prepare the meat. I will start with the method of cooking for the meat first, since it is the featured dish. Otherwise, follow my directions in the introduction to make things easier in the kitchen. 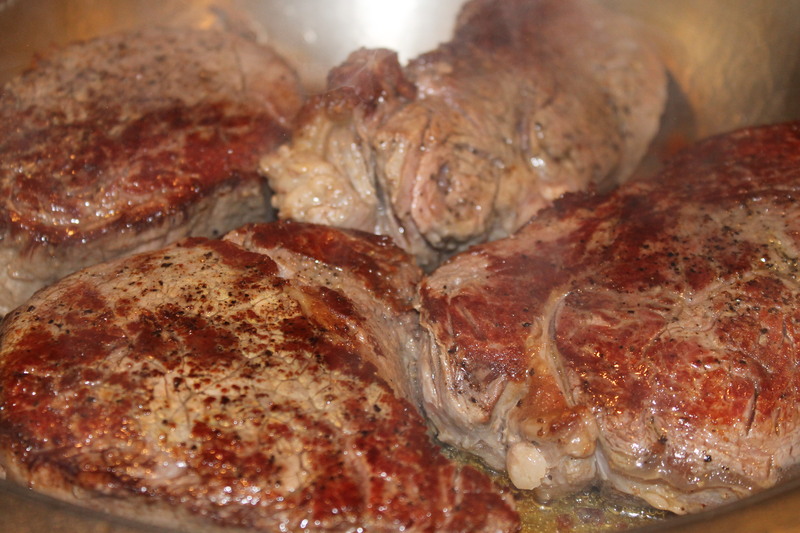 1) Season the meat with salt & pepper and let it sit at room temperature for at least 30 minutes. Pre-heat oven to 350 degrees. 2) In the meanwhile, in a large pan, (that can withstand the oven temperature) over medium-high heat, heat oil, sear the meat, 3 minutes on one side, then 2 minutes on the other side. There will be a nice sizzling sound, and the meat will get a nice brownish color as pictured. 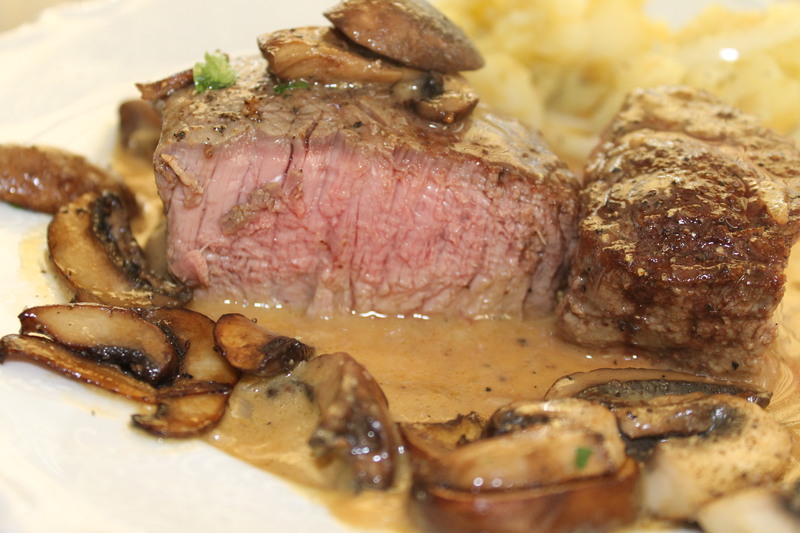 3) Finish cooking in the oven for 15 minutes, for a medium-rare to medium temperature based on your oven. Remove, cover with foil and let it sit for 5 minutes to retain the juices. 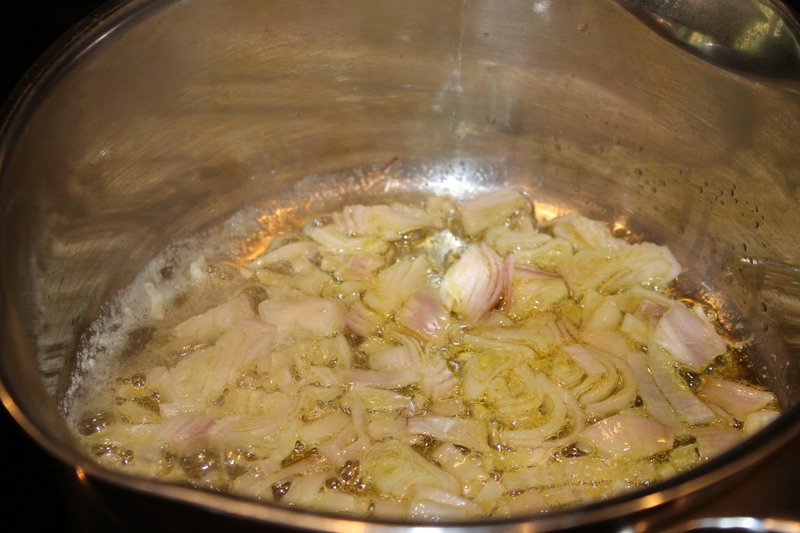 1) In a large pan, over medium high heat, heat the oil and the butter, then sweat the shallots for about 2 minutes. 2) Deglaze with the sherry and lower the heat, about 1 minute. 3) Add the stock, bring to a boil and simmer for about 1 minute. 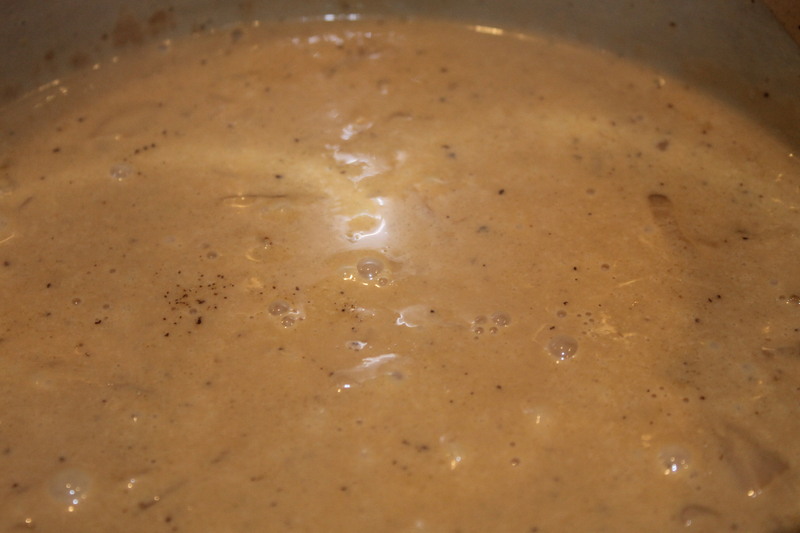 4) Whisk in the cream, let it reduce on low heat for about 15 minutes. Add salt and pepper to taste. Stir occasionally. pour in the sauce. Stir and simmer an extra 2 minutes, and set aside. It will thicken upon sitting while you’re busy preparing the other dishes. Before serving, just warm it up on very low heat and stir. 1) In a medium size pan, over medium-high heat, heat oil and butter, add the mushrooms and sauté them for about 10 minutes while stirring occasionally. I also served a salad, and potatoes as a side dish, not featured. 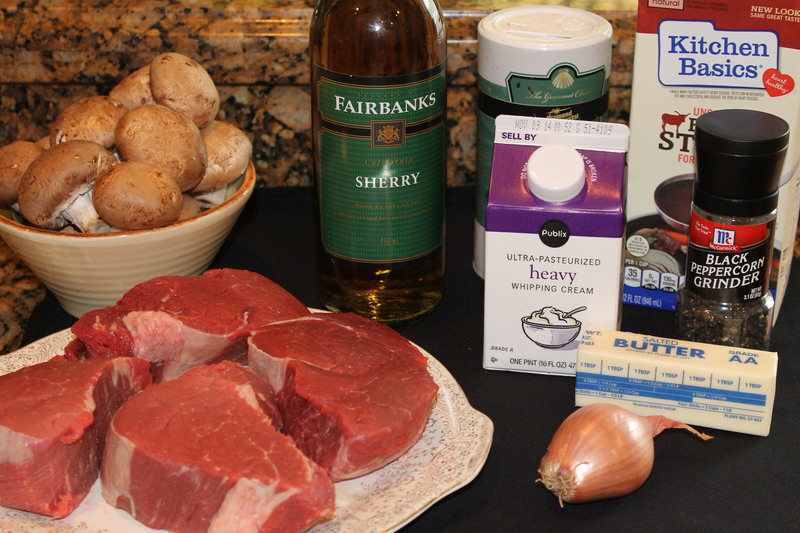 *You can substitute the Filet with a Sirloin cut, to make it a more affordable dish. Just be sure not to overcook it, as it can get tough. I suggest you cook and clean as you go along, otherwise, the kitchen will be a big mess. You will have to do some juggling, but in the end, you and your family will be very happy with the amazing results. Now it’s time to plate the Filet Mignon. 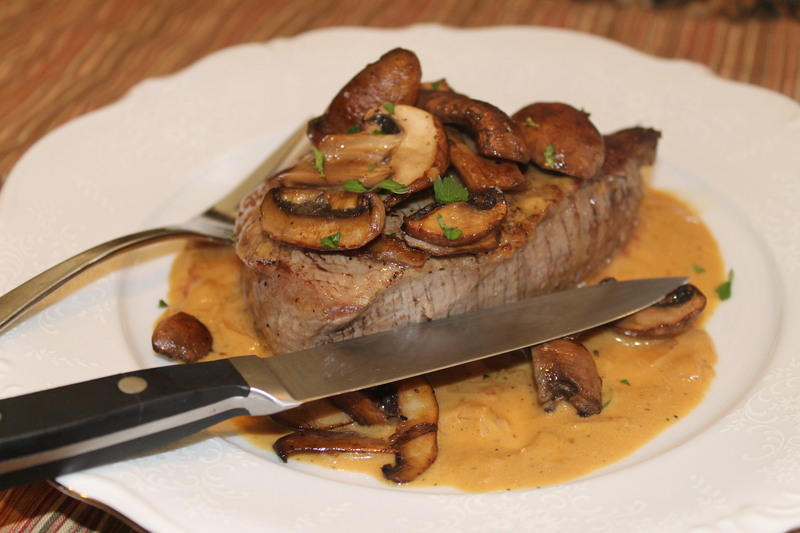 Swirl some Sherry Cream Sauce on the bottom of the plate, place the Filet on top, drizzle more sauce, then garnish with mushrooms and parsley. Bon Appetit! I hope you have enjoyed reading this post and will find the time to make this exquisite dish. Always live life to the fullest, and celebrate with good food and wine. Happy Cooking from Gina’s Kitchen!